1 » Though they had to suffer through a two-hour rain delay, Gainesville Regional hosts No. 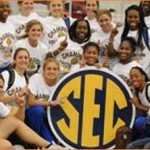 4 Florida Gators softball (44-8) defeated the Bethune-Cookman Wildcats (32-23) 6-0 in the first game of the 2010 NCAA Tournament on Friday night at Katie Seashole Pressly Stadium. Junior starter Stephanie Brombacher (30-6) rang up 11 opposing hitters over seven innings to earn her 30th win in a complete game effort. In support, junior catcher Tiffany DeFelice (1-3) tallied three RBI and junior outfielder Kelsey Bruder (2-3) nailed her 12th home run of the season (and the team’s 97th) in the second inning. The Gators will face Central Florida (which defeated Florida International 7-1 on Friday) in the first game of the day on Saturday. 2 » On the opposite end of the spectrum is No. 6 Florida men’s tennis (21-5), which ended their season Friday with a 4-2 upset loss to the No. 12 Georgia Bulldogs (20-8) in the NCAA Tournament Round of 16 at the Dan Magill Tennis Complex in Athens, GA. The No. 8 doubles pair of redshirt senior Antoine Benneteau and junior Alexandre Lacroix, which led the Gators all season, fell 8-3; each player also lost their singles matches. In fact, none of Florida’s ranked players or pairs were victorious Friday. Benneteau and Lacroix will continue competing in NCAA individual tournaments where they will participate without being tied to a team result.